No more complicated than tossing a salad, this recipe makes a great, quick starter. It’s delicious with Parma ham too – just put 6 slices on a baking sheet in the oven above the gratin and allow to crisp up for 3–4 minutes, then scatter over. Preheat the oven to 230°C/gas 8. Trim the bases of the chicory heads and discard any damaged outer leaves; separate out the remainder. Toss these in a bowl with the olive oil, then gently mix in the Roquefort and figs. 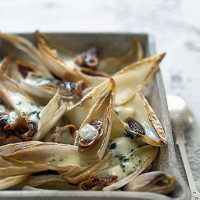 Tip into a large roasting dish (about 35cm x 25cm) and roast for 8–10 minutes until the chicory is golden on top and the cheese is melted and gooey. Chicory and blue cheese is a tough call for wine. Something gentle and easy-going is the best solution, such as a quince-flavoured Piedmontese white.